Q. Who said this? "I have only two passions - space exploration and hip-hop." A. Buzz Aldrin, space exploration pioneer, on Apollo 11, second person to walk on the moon, 79-year-old white dude. I thought this was a joke when I first saw the posting on Wired, but it's real - Buzz recorded a rap song, "The Rocket Experience," with help from Snoop Dogg, Quincy Jones, Soulja Boy and Talib Kweli (who I didn't know but according to Wikipedia is "one of the best-known and critically, if not commercially, successful rappers in alternative hip-hop). Snoop had the picture taken so he would know after the high wore off that this really happened. The Times Online article started out appropriately enough: "It was probably one small step for Snoop Dogg but it was one giant leap for Buzz Aldrin when he teamed up with the hip-hop artist to record a rap single ... commemorating the 40th anniversary of the first lunar landing next month." Forget stately ceremonies and parades and the like - we're going old school, takin' it to the streets - getting the word out to "reignite public interest in the U.S. space program and teach younger generations about space exploration." "Young people have lost any interest in space that isn’t in a video game or a movie house. Many don’t really know that Man has stood on the Moon," he said. "But these incredible rappers speak to the new generations and know how to reach them. The Americans who will take Man to Mars are already born and they don’t even know that space is Man’s fate." 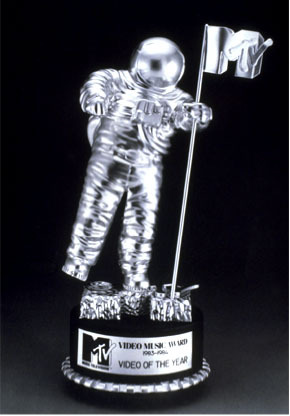 This isn't Aldrin's first brush with music - he is the model for MTV's Video Music Award moonman. Proceeds will go to Aldrin’s non-profit foundation ShareSpace, the article said, which supports space education and advocacy programs carried out by the National Space Society, the Planetary Society and the Astronaut Scholarship Foundation. Snoop applauded Aldrin — excuse me, Doc Rendezvous — on his vocal skills. "That's hot right there, man. That's gangsta." I beg of you: watch the video. It's only about 4-5 minutes. The mock interviews with the rappers/producers are phenomenal - whitey on the moon, blackstar, the "beef" between "earthwalkers" (or earf-walkers, in Snoop-speak) and moonwalkers, Buzz's shades in the studio, Snoop and Kweli rockin' out in the background to Buzz's song, Snoop teaching Buzz the finer points of rapping... Note the astronaut cut-out, Buzz's book, and a VMA award in the studio. You'll also boost your vocab - Kweli throws out "ineffable." Really, it's an educational, entertainment win-win. And I'm not gonna lie, the last 20 seconds or so, Snoop's "re-mix," is actually quite lovely against the pictoral montage. Buzz's exploration into new frontiers is related to another movement in nerd-meets-hip-hop: Nerdcore Rising. The documentary "Nerdcore Rising" investigates "the newest wave of hip-hop, nerdcore, as it follows the godfather of the genre, MC Frontalot, on his first national tour," according to the Nerdcore Rising site. "Beginning in South Carolina and culminating in nerd mecca - the Penny Arcade Gaming Convention in Seattle - masses of fans across the country come out to bask in the Front's geek glory as he strives to achieve mainstream success." The movement isn't just about the DVD - it's the flag behind which the WoW playing, Second Life loving, bespectacled hip-hop lovers rally. Nerdcore is "the unabashed embrace of nerddom set to sizzling beats that may or may not inspire awkward and/or slick dancing, spirited bobbing of heads, and rigorous waving of hands in high oxide count air. MC Frontalot stands at the helm of these nerdfans as the rapper de la resistance," the site proclaims. What is nerdcore hip-hop? Nerdcore hip hop, or geeksta rap, is a subgenre of hip-hop music that is performed by nerds or geeks, the site says, and is characterized by themes and subject matter considered to be of general interest to nerds, though it can appeal to others as well. As a niche genre it holds to the DIY ethic, the site says, and has a strong amateur tradition of self-publishing and self-production. Themes can run the gamut, but definite favorites include Star Wars, science and computers. Key to being "nerdcore" is the combination of a nerdly topic with a hip-hop base. Based on this definition, Aldrin is officially nerdcore material, and with his national hero status could take this movement to infinity - and beyond!